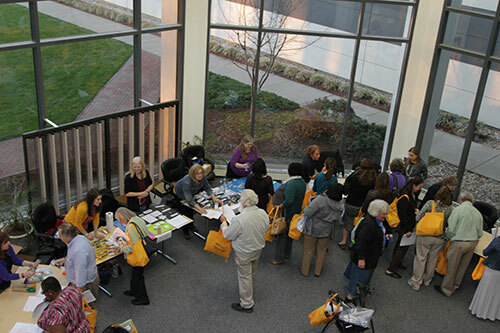 A highlight of the Jefferson Lab Science Activities for Teachers program is Teacher Night – held at the end of the program. 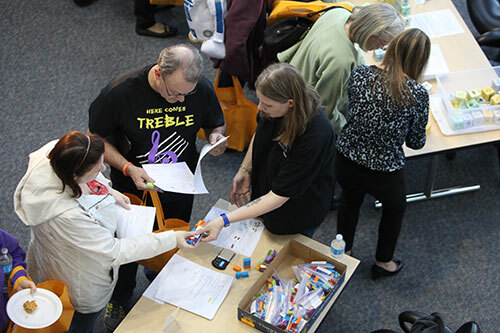 During the event, JSAT participants share with hundreds of teachers, from across the area, their favorite and most effective classroom science activities. These are photos from the Teacher Night held on April 1, 2015; next year’s event will be April 13, 2016. 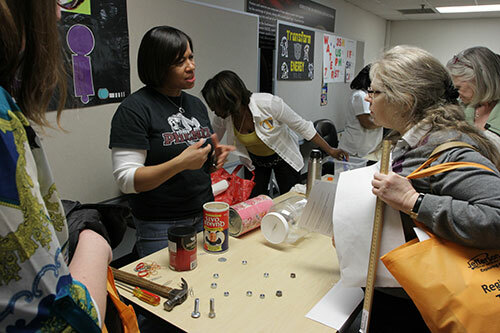 NEWPORT NEWS, Va. -- The U.S. Department of Energy's Thomas Jefferson National Accelerator Facility, or Jefferson Lab, is currently accepting applications for its science enrichment program for fifth-, sixth- and eighth-grade teachers of science. The after-school program is designed to increase teachers' knowledge of the physical sciences and to strengthen their teaching skills. It will run from September 2015 through May 2016 and is called the Jefferson Lab Science Activities for Teachers program, or JSAT. "At the elementary- and middle-school levels, teachers, with little or no formal background in science education often find themselves tasked with teaching the science curriculum," says Lisa Surles-Law, the 8th grade JSAT program administrator. "This program is a primer for them and a refresher for those with a formal science education. 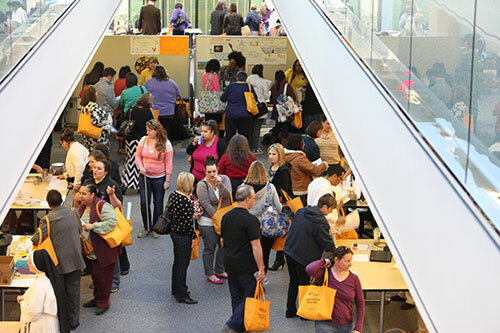 JSAT provides attendees with a wealth of information, materials and activities to take back to their classrooms, and the opportunity to network with other teachers." 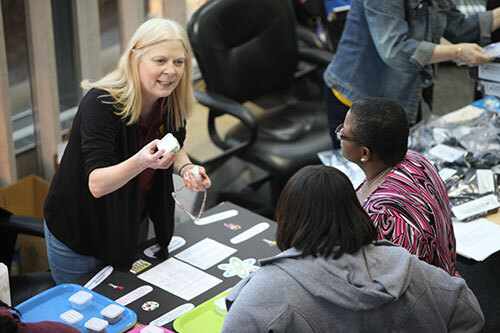 The 2015-16 program will include interactive activities to enhance physical science instruction at the upper-elementary and middle school levels, and lectures by Jefferson Lab staff on the applications of science. Topics will include matter, atomic structure, energy transfer, force and motion, magnetism and electricity, waves and sound, simple machines, optics and the watershed cycle. Program participants receive supplies and materials so they will be able to conduct all the planned activities in their own classrooms. Participating teachers can earn a stipend and up to 48 recertification points for 2015-16. Fifth-grade teachers will meet on alternating Thursday nights, sixth-grade teachers will meet on alternating Tuesday evenings, and eighth-grade teachers will meet on alternating Wednesdays. The sessions will take place from 5-7 p.m. at Jefferson Lab, located at 12000 Jefferson Ave. in Newport News. http://education.jlab.org/jsat/index.html. Questions may be addressed by emailing Surles-Law at surles@jlab.org or calling 757-269-7567. The application deadline for the 2015-16 program is Friday, Sept. 11. The Virginia Mathematics and Science Coalition, an alliance of education, corporate, and public policy leaders working together to revitalize mathematics and science education in prekindergarten through graduate school, recognized JSAT in 2011 with a Programs That Work Award. According to the VMSC web site, the award recognizes "exemplary mathematics and science programs for which there is evidence of a positive impact on student or teacher learning." The JSA Initiatives Fund Program was established by Jefferson Science Associates, to support programs, initiatives and activities that further the scientific outreach, and promote the science, education and technology missions of Jefferson Lab in ways that complement its basic and applied research focus. Initiatives Fund awards are for those projects that benefit the lab user community and that leverage commitments of others. JSA, a joint venture between the Southeastern Universities Research Association (SURA) and PAE Applied Technologies, manages and operates Jefferson Lab for the U.S. Department of Energy. Information about the JSA Initiatives Fund program is online at: www.jsallc.org/IF/IFIndex.html.